AWHN was motivated to develop an Australian Women’s Health Charter by the compelling evidence that what is needed for women to experience optimal health and well-being is a ‘whole of government’ policy and gender based services. The Vision of this Charter is to inspire Australians to value women and to understand that a woman’s wellbeing is the shared responsibility of the entire community. Supporting evidence for the Charter can be found in AWHN’s The Voice of Womens Health. 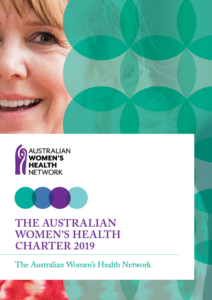 The Australian Women’s Health Network called on political commitment in the lead up to the Federal election 2019 to address the five key proposals in the 2019 AWHN Women’s Health Charter. We believe that the five proposals, when implemented by a national government will mark a new beginning for women’s health at the national level and contribute to the creation of a fair and healthy society. AWHN has received two very positive responses from the Labor party and the Greens and no response from either the Liberal or National parties. Responses to each of the Charter proposals are shown in the table below and the detailed responses received can be accessed via the following links. This information is being made available for your consideration in exercising your vote. Click on the image above to download the Charter. The table below shows the response or lack of response received by the Australian Women’s Health Network to its call for commitment to address the five key proposals in the 2019 AWHN Women’s Health Charter from the four major political parties in the lead up to the 2019 Federal election.